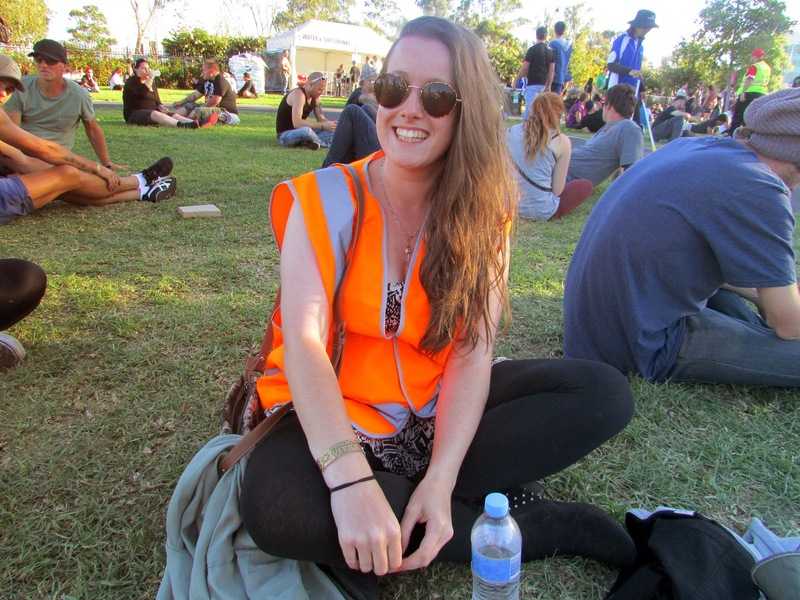 A while ago I came to the conclusion that there are two types of festivals, bogan festivals and hipster festivals. Soundwave, however, did not fall into either of my two categories. It was definitely something different altogether. I've always thought that Soundwave has always had a consistently amazing lineup for the genre it caters for, even if you don't like this sort of music, you can't deny that. This year was no different with rock gods Metallica headlining and a collection of the world's elite rock, metal and punk bands putting on great shows. I don't usually listen to this sort of music but I did know quite a few of the bands on the lineup and I was a fan of one or two of their songs so it was awesome to see them anyway. The first act we saw was Stone Sour who are an American supergroup with members from Slipknot and Soulfly. I knew one of their songs called Through The Glass that a friend of mine had introduced my to quite a few years ago. 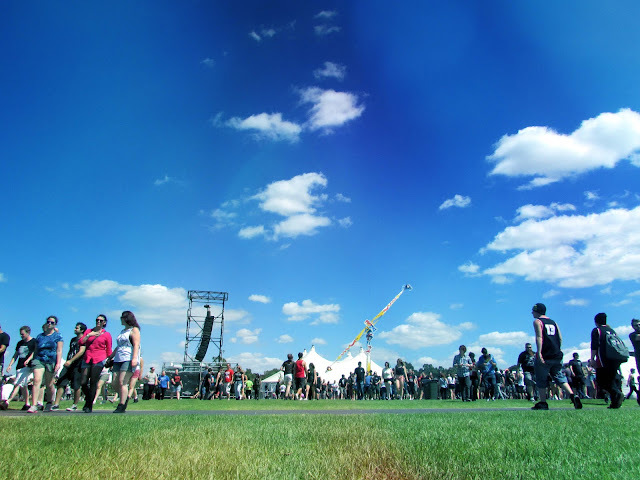 We spent a lot of the day chilling and waiting for the headliners. 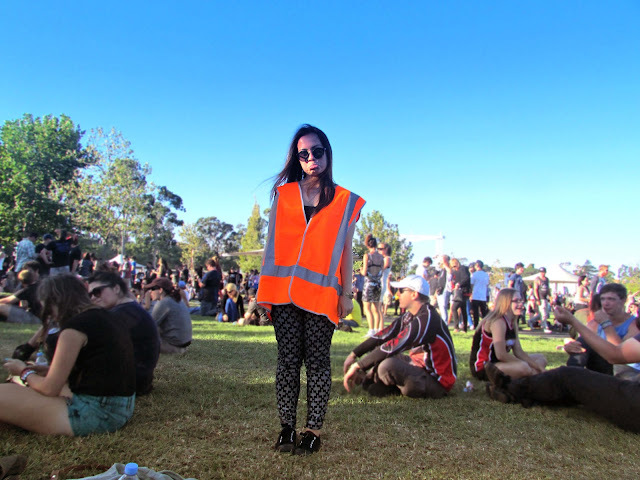 Oh and if you're wondering why we're wearing orange safety vests, it's because we were volunteering at the festival as crowd controllers. All the vests were XL so they didn't exactly fit my friend here. We also relived childhood memories when Blink 182 rocked the stage but we were so far back that all the photos looked terrible. We did notice that all their songs seemed to sound the same, but hey, they've made a lot of money off that so good on them. Now if you're a 90s child you will remember Garbage's mega-hit Cherry Lips, and hearing Shirley Manson belt out this song was one of the highlights of my day. We think we may have uncovered a Soundwave conspiracy though, and that was the abundance of red-heads. We came to the conclusion that Soundwave is actually a cover for a ranga convention and we had unknowingly infiltrated it. The band I was probably most excited to see was Paramore. A bit more girly for my liking haha. I like to be able to sing along to bands and I just happen to know pretty much all the words to most of Paramore's songs, although so did most of the girls in the audience. And we weren't holding back. Hearing the audience belting out The Only Exception was a truly memorable experience. I felt like we needed to bust out some lighters and sway from side to side. I was super impressed with Hayley Williams' voice. She spent most of the set running around, hunched over and lying on the floor and she still sounded amazing. Finally, after waiting for about 11 hours, Metallica stormed onto the stage and completely owned the festival. I grew up listening to Metallica and similar bands on long road trips in the car with my dad so seeing them live was mind blowing. The highlight was definitely them singing Nothing Else Matters and Enter Sandman and the crowd going absolutely nuts. I knew most of the words even though I didn't realise I did. As fire lit up the sky and inflatables rained down, the day came to an end and we had to shuffle our way out of the venue. It was an amazing day only dampened by the fact that we were stuck in the car park for an hour after the festival before we could go home. We were just so thankful to be sitting down that it didn't make us too angry. Soundwave was definitely a very different experience to most festivals and I think the demographic of the crowd had something to do with that. I would love to go back next year.